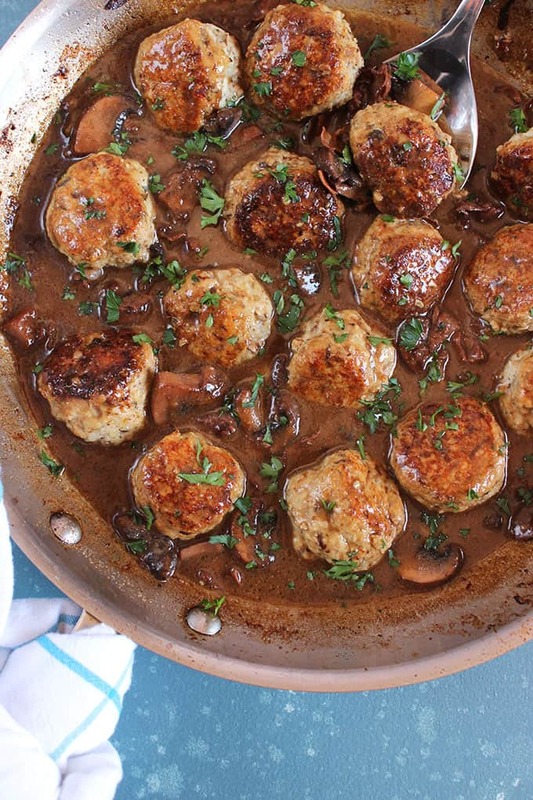 A family favorite from day one, this recipe for One Pot Chicken Marsala Meatballs is a skillet full of rich, creamy flavor. Tender chicken meatballs that are bathed in a savory marsala sauce will make the family beg to add them to your weekly meal plan. Fast, easy and totally amazing. We are nearing the end of the school year and I’m finally starting to share all my favorite one pot dinners with you. 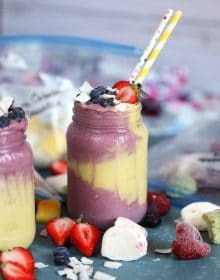 I’m sorry I held off for so long for so many reasons….one, I kept your feed filled with desserts….like I’m a dessert blogger or something but I’m not. And I know you’re here for a little bit of everything but I had such a sugar addiction I just couldn’t stop. But….now, I, too need some more one pot, easy dinners to get my through these last few long weeks of school. 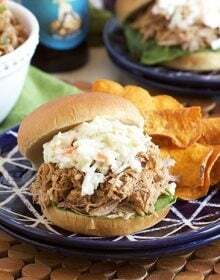 And two, I’m tired of take out all the things and since I know how to cook I decided to get back to more savory dishes that we can all whip up quickly and easily. 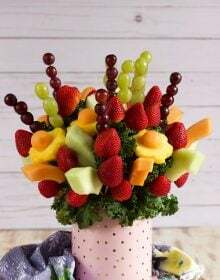 And three….my pants are seriously getting tight and I don’t know if it’s the sweets…the new workout plan…or early menopause but that just needs to end. So, I decide to share with you one of my favorite things ever….this recipe for Chicken Marsala Meatballs because it’s seriously easy….and seriously amazing. And while we’re talking about the end of the school year….am I the only one that’s looking forward to the end of all the paper piles that manage to grow throughout the week. I mean, really, let’s save some trees! 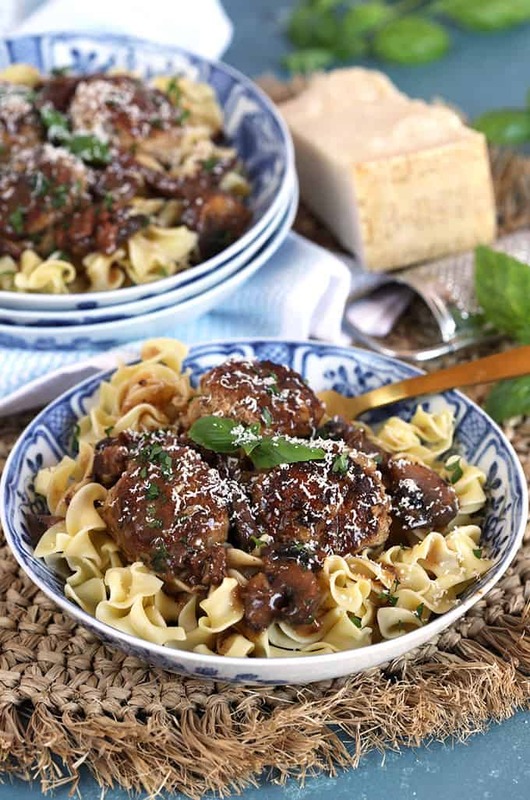 Back to the meatballs….I’m a huge fan of chicken marsala and I’ve recreated a couple easy recipes for you already like this super popular Slow Cooker Chicken Marsala Stew. It’s really old….the recipe, not the dish…like it’s not been sitting in the back of my fridge since the first post was published….so please excuse the photos…but it’s so good and comforting and totally easy to make that it’s been going strong since I posted it many years ago. 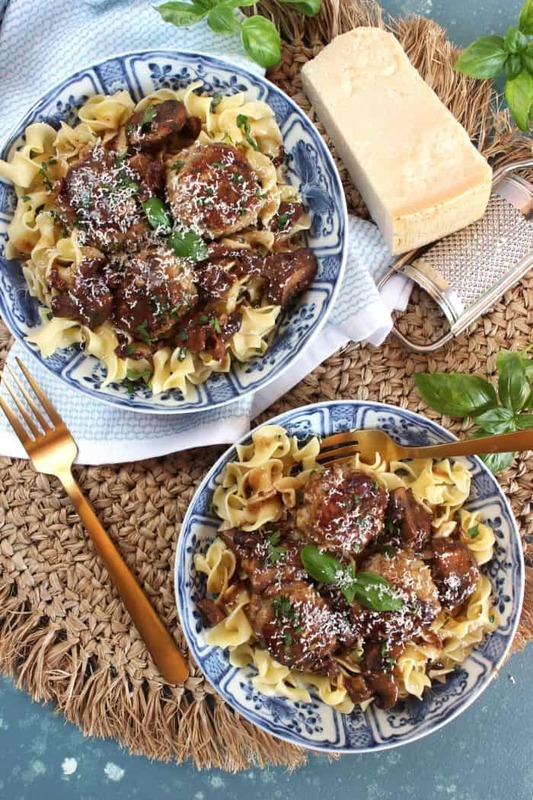 But, one day I was craving Chicken Marsala and meatballs and since that’s kind of protein overkill I thought I’d combine the two to create a unique recipe…calling it Chicken Marsala Meatballs. But FIRST…..you may be thinking….what is Chicken Marsala Made of? Chicken Marsala is one of my favorite dinner recipes. 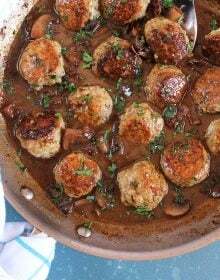 It’s quick, easy and can be made in one pot, this recipe for Chicken Marsala Meatballs is other level. It’s just another way to get the flavors of Chicken Marsala with a fun twist. Chicken Marsala is made by dreading chicken in flour and then frying in a pan. 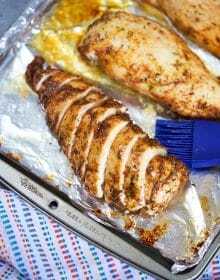 After the chicken is fried to a golden brown, a sauce is made by reducing marsala wine to a syrupy consistency along with sauteed onions or shallots and mushrooms. I like to stir in a pat of butter for an ultra velvety smooth sauce with a little creaminess. 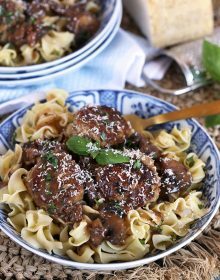 The same technique is used for these Chicken Marsala Meatballs but without the flour dredge saving you one messy step that makes these my go-to dinner recipe. I Googled the recipe to see if it had been done before because I thought I was being all clever and crafty….and guess what I found….Giada’s Chicken meatballs in marsala sauce. Yep, I’m so original. But I went with my gut and made my own version in the easiest way I could find….cramming everything into one pot so we don’t have many dishes to do when we’re done and my version is quite magical if I do say so myself. 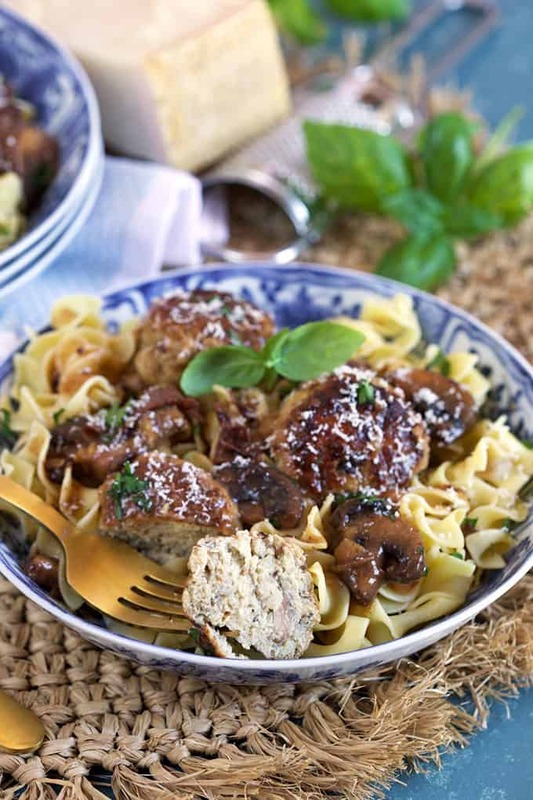 Which Marsala wine is best for Chicken Marsala Meatballs? 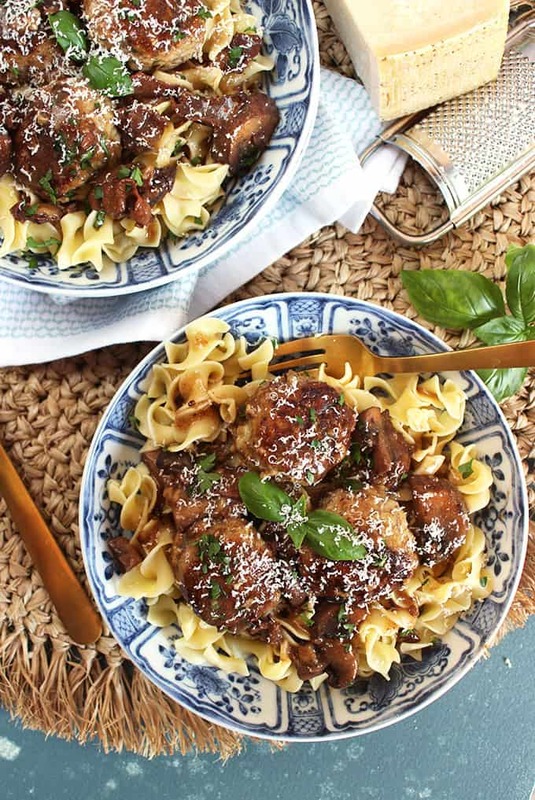 There are both dry and sweet marsala wines in the store but for savory dishes like these Chicken Marsala Meatballs you definitely want to go with the dry marsala wine. Sweet marsala wine should be reserved for desserts or cordial cocktails, only. These Chicken Marsala Meatballs are tender and juicy with a hint of marsala baked right into them. I even lightened up the entire dish by adding a ton of finely chopped mushrooms to the chicken mixture to keep them from drying out and reducing the calories. If you don’t like mushrooms you can definitely leave them out but my mushroom hating kids didn’t even know they were in there….and I did the same thing with this turkey meatloaf years ago….they still have no clue it has mushrooms in it and they request it all the time. So….winning at mom life over here. The marsala sauce tastes just like it would in your favorite Italian restaurant but, again, lighter on calories and fat and all that other nonsense that we don’t need every day. 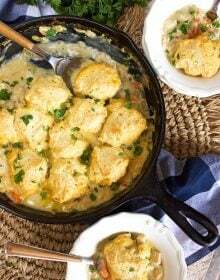 It’s almost the same as the sauce in this Creamy Chicken Marsala Skillet recipe except this one doesn’t have cream. But it’s another one pot dinner that you’re family will definitely be on board with and if you don’t have time to roll a bunch of meatballs…it’s definitely a winner in my book. Quick and easy, One Pot Chicken Marsala Meatballs is a family friendly recipe that comes together in a hurry for busy weeknight dinners. Add the onion and garlic cloves to a food processor. Pulse several times until finely chopped. Add half the mushrooms to the food processor and pulse another few times until mushrooms are finely chopped. Transfer the onion/mushroom mixture to a large bowl. 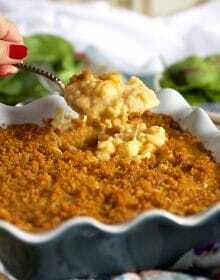 Add the ground chicken, bread crumbs, egg, 2 tablespoons marsala wine, 1/4 teaspoon kosher salt and 1/4 teaspoon pepper. 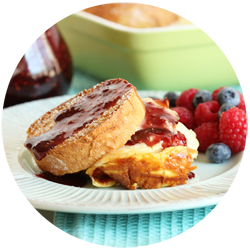 Using clean hands or a pastry blender, mix the ingredients until well combined. 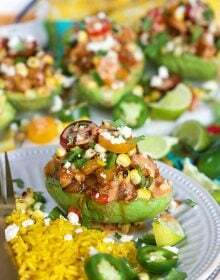 Form 2 tablespoons chicken mixture into a ball and place on a baking sheet lined with parchment. Repeat until all mixture has been used. Heat the olive oil in a large skillet over medium high heat. Add the meatballs to the pan being careful not to crowd the pan and working in batches, if necessary. Brown the meatballs on all sides. Transfer the skillet to the oven and roast for 10-15 minutes or until cooked through. Remove the skillet from the oven and transfer the meatballs to a platter. Cover with foil to keep warm. Return the skillet to the stovetop and add the butter to the pan. Melt the butter oven medium high heat. Add the remaining mushrooms to the pan and cook for 2-3 minutes, stirring occasionally. Stir in the minced garlic and cook for 1 minute. Sprinkle the cornstarch over the mushrooms and stir. Cook for 30 seconds. Pour the remaining marsala wine over the mushrooms and deglaze the pan, scraping the bottom of the pan with a wooden spoon to loosen the brown bits. Stir in the chicken stock and bring the mixture to a boil. Add the onion powder and Italian seasoning. Season with salt and pepper, to taste. Return the meatballs to the pan and cook for 3-4 minutes just to warm through. Serve the meatballs with the sauce over pasta or mashed potatoes, if desired. Meatballs can be made in advance and frozen in an airtight container for up to 3 months. 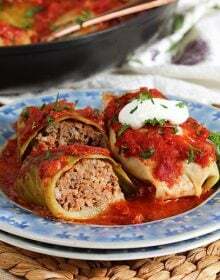 Sauce can be made up to 48 hours in advance and stored in an airtight container in the refrigerator. To heat the frozen meatballs, arrange on a baking sheet lined with parchment and bake at 425 degrees until no longer frozen in the center.